Find artworks, auction results, sale prices and pictures of Carlo Grubacs at auctions worldwide. Carlo Grubacs VENICE, A SUNSET VIEW WITH VARIOUS VESSELS IN THE LAGOON WITH THE DOGE'S PALACE AT RIGHT AND THE BASILICA OF SANTA MARIA DELLA SALUTE IN THE DISTANCE AT LEFT VENICE 1802 - 1870 signed lower left:C Grubas. oil on canvas 11 1/2 by 14 1/8 in. ; 29.2 by 35.9 cm. Provenance Private collection, Italy. 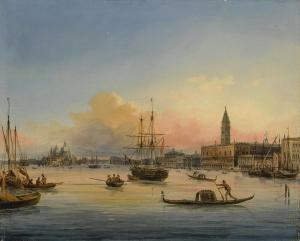 Catalogue Note Depictions of Venice at sunset were popular themes for Carlo Grubacs, as well as his son, Giovanni Grubacs, both of whom were celebrated painters of Venetian veduté during the nineteenth century. Comparable sunset scenes by the Grubacs dynasty have recently been sold in these rooms, includinga view of the Bacino di San Marco and the Dogana by Giovanni Grubacs.1 1. Anonymous sale, New York, Sotheby's, 26 January 2017, lot 297, for $162,500. 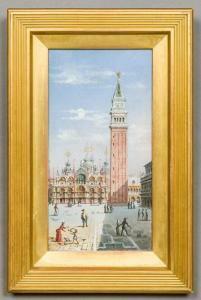 CARLO GRUBACS (1810 - circa 1870) Italian Figures in Piazza San Marco Before the Bassilica and Campanile Bodycolour, signed, old label to verso for Thomas Agnew & Sons, London, framed and glazed. 13.5 x 26 cm. Provenance: THE SIR WILLIAM AGNEW PICTURES FROM ROUGHAM HALL (Lots 887-905 inclusive) Sir William Agnew, 1st Baronet (1825-1910) English, was one of the most successful art dealers of the 19th century, with Thomas Agnew & Sons, his London art business in Mayfair, flourishing as one of the leading art dealerships in London from 1860 until it closed in April 2013. Originally his early clients were the new hugely wealthy class of industrialists, merchants and bankers making it big in industrial Britain. Sir William knew many of the contemporary artists of his time personally. In 1870 Sir William invited Frederick Walker (1840-1875) British, John Evan Hodgson (1831-1895) British, Charles Leslie (1839-1886) British and Stacy Marks (1829-1898) British, to his Salford House, Summer Hill. When asked if they could play billiards in the newly added billiard room on Sunday morning, Sir William replied that they did not do that on Sundays at Summer Hill. Having left the room in slightly haughty manner, Sir William returned an hour later and found that Walker had just finished a large mermaid on the lining paper of the walls (the Paris wallpaper had yet to arrive), Charles Leslie had painted a landscape of the Thames, Stacy Marks had sketched Walker and Agnew playing billiards, and Hodgson had started a highland landscape. After working until midnight and all the next day, the Paris wallpaper was cancelled and the drawings varnished. Sir William was also a well known figure at auction. There is a description of Sir William at the Christie's Wells sale in 1890 which reads "Christie's was crammed full on Saturday afternoon, though the sale could have been conducted quite as well in a four wheel cab for Mr Agnew bought nearly everything. Roughly speaking he spent nearly £50,000 out of £77,000 which the sale produced.... You cannot see Mr Agnew's jovial countenance, you cannot hear Mr Agnew's formidable voice, but that hat of his holds you like the eye of the ancient mariner. Every bob of the hat means a thousand. It is splendid." In 1889 Sir William bought Edward Burne Jones's four major panels illustrating the Legend of the Briar Rose and exhibited them in his Bond Street Gallery from 1890, attracting over 1,000 visitors per day. Sir William's business was now becoming more and more international with clients including Junius Spencer Morgan (183-1890) American, Cornelius Vanderbilt (1794-1877) American, as well as several members of the Rothschild family. Sir William's last great achievement was probably the collection he assembled for Edward Cecil Guinness, 1st Earl of Iveagh from 1887 which included a Boucher, two Van Dycks, walls full of Gainsboroughs, Reynolds and Romneys, and a Vermeer and one of the greatest late Rembrandt self portraits ever painted. Few people knew of the Iveagh collection as business was conducted in great secrecy and all communications were in code. In total Lord Iveagh bought 240 pictures and drawings from Agnew's and when he left Kenwood to the nation in 1927 sixty-two of the sixty-three pictures included were purchased from Agnew's. The collection was described by the Guardian as the most valuable gift of paintings to the nation of the 20th century. Sir William retired from the Agnew's firm in 1895 when Lord Rosebery had him made a baronet for his services to art. When he died Sir William was described in newspaper obituaries as a Prince of Art Dealers. 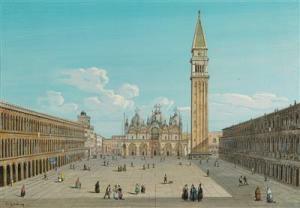 Carlo Grubacs Blick auf die Piazzetta di San Marco mit Dogenpalast Gouache auf Bütten. 11,6 x 15,6 cm. Gerahmt. Literatur F. Magani: L´ampia Venezia dei Grubacs, 2017, S. 78. 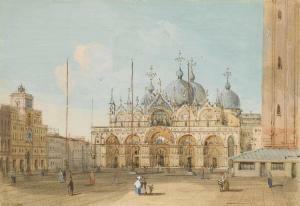 Carlo Grubacs View of the Piazzetta di San Marco with the Doge's Palace Gouache on laid paper. 11.6 x 15.6 cm. Framed. Literature F.Magani: L´ampia Venezia dei Grubacs, 2017, p. 78. 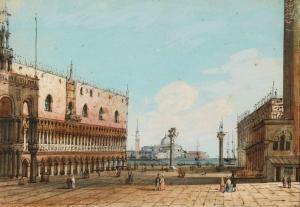 Carlo Grubacs (1810 - 1870) Lot 18: CARLO GRUBACS | Venice, A view of Saint Mark's Square Description: gouache and watercolor on paper Dimensions: image: 4 3/8 by 6 3/8 in. ; 11.1 by 16 cm. ; sheet: 5 3/8 by 7 1/2 in. ; 13.7 by 19.1 cm. Condition Report: The image is in good condition, and the medium remains fresh and vibrant. There is a border surrounding the image that has slightly discolored, but this is not visible when framed. Offered in a carved giltwood frame. The lot is sold in the condition it is in at the time of sale. The condition report is provided to assist you with assessing the condition of the lot and is for guidance only. Any reference to condition in the condition report for the lot does not amount to a full description of condition. The images of the lot form part of the condition report for the lot provided by Sotheby's. Certain images of the lot provided online may not accurately reflect the actual condition of the lot. In particular, the online images may represent colours and shades which are different to the lot's actual colour and shades. The condition report for the lot may make reference to particular imperfections of the lot but you should note that the lot may have other faults not expressly referred to in the condition report for the lot or shown in the online images of the lot. The condition report may not refer to all faults, restoration, alteration or adaptation because Sotheby's is not a professional conservator or restorer but rather the condition report is a statement of opinion genuinely held by Sotheby's. For that reason, Sotheby's condition report is not an alternative to taking your own professional advice regarding the condition of the lot.